Found on page one of Personal Care, using zip code 90210. You are allowed to print twice per computer. 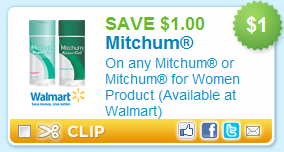 Mitchum® has been on sale for $1.99 at CVS and Walgreens - after the coupon it would cost $0.99. But remember - you can price match at Walmart.